art: nobody needs art. nova. Looking so hot he could be positively tropical David Gandy in this newly released shot for Brazilian brand Sergio K.
life: something bright for a delicate sunday! Saturday night quickly turned into Sunday morning. AP. headed off into town for a bank holiday soiree which has left us nursing a delicate head this morning (and afternoon!) starting with drinks at the Hilton Park Lane, where we partied with the Leeds rugby team who just happened to be in town, and finishing our evening at the rather swanky private members club Home House, of course after downing one too many bottles of bubbles and a couple of mojitos for good measure we swung our fabulous selves back home to bed, well, ok, not exactly straight to bed, but back home at least! So we thought what better to share with you than something bright to clear through the hangover. In the heart of a favela in Rio de Janero (where else?) called Santa Marta – a huge art project has given bright splashes of colour to the community. You can read about the project by clicking here. The artwork aims to brighten up the neighbourhood, giving the community a boost by educating and employing local workers. The project is an initiative by Dutch art duo Jeroen Koolhaas and Dre Urhahn. 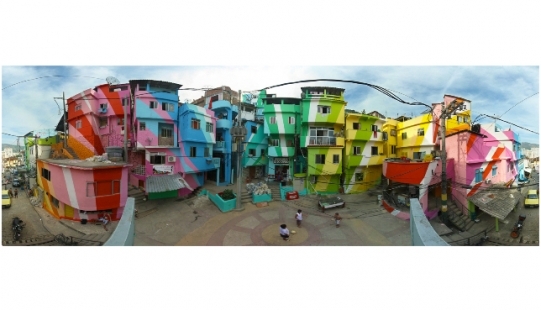 The artists’ goal is to transform the whole hillside favela into one big colourful area, and we here at AP. couldn’t think of a better way to enhance the environment – we can however think of several area’s in South London which could do with their magic touch, Boris – if you’re out there give those guys a call!